tommyontour: View New Induction Film with Healthwatch Essex, Broomfield Hospital and Dementia Carer Voices. 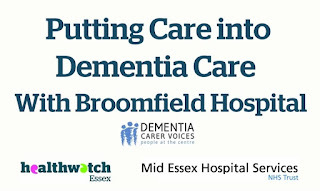 View New Induction Film with Healthwatch Essex, Broomfield Hospital and Dementia Carer Voices. I first met Tommy in June 2015 when I invited him to speak at our annual Healthwatch Essex Ambassador event. I had been forwarded a link to one of his films and, from that moment, I knew that we absolutely had to work with him! Since then, Healthwatch Essex and Dementia Carer Voices have worked on a couple of projects together, the latest being our ‘Putting care into dementia care’ training film – soon to be embedded in Mid Essex Hospital Trust’s induction training programme. Around the time we first worked with Tommy, Healthwatch Essex launched a free Dementia Handbook for carers, which brought together information about the sources of care and support in Essex available to people who are living with dementia and their carers. This was developed in response to a piece of research we had conducted not long before, where we discovered that people experienced difficulty and confusion when trying to find out about care and support services. Later on that year, we launched our Carer’s project, to raise awareness of the issues affecting carers in Essex. The findings of one of our reports “Carers Said” has since been used as evidence by the Department of Health. One of our first ventures for this project was our ‘Carers’ Journey’. We invited Tommy back to join us on a three-day road trip of Essex in our Chatterbox cab, delivering a series of talks at hospitals, care providers, carers groups and universities. We used Tommy’s powerful story to highlight the importance and value of listening to people’s lived experience of services, in order to find ways to improve them. Hundreds of health and care professionals made pledges of small actions to make a difference to the lives of patients and their carers. Broomfield Hospital in Chelmsford took part in our ‘Carers Journey’ tour. We were impressed with the exciting projects and activities going on at the Hospital, for example their Forget-Me-Not garden, designed to offer a calm, sensory space to support people diagnosed with dementia. The team at Broomfield were keen to collaborate with us to develop their work even further, and that is where the idea for a training film was conceived. 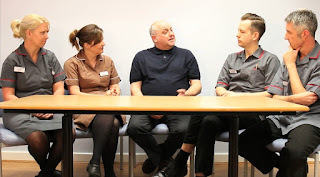 So earlier this year we invited Tommy back to Essex and spent a day filming discussions and interviews with nurses, matrons and dementia specialists at Broomfield hospital. Linking these clips to parts of Tommy’s powerful talk, and featuring testimonies from staff, the film illustrates how listening to the patient’s story can inspire innovations in person-centred care. By taking the time to find out more about the person, and what matters to them, we can communicate more effectively with them, develop meaningful activity plans and better understand their needs and wishes. As an organisation, Healthwatch Essex believes the best services are those that are developed and delivered by listening to people and using that lived experience to help shape them. This training film harnesses the passion and drive of Tommy and the staff at Broomfield Hospital and demonstrates how health and care professionals can make their patient’s (and carer’s) experience the best it can possibly be. Tommy will be back once again to launch the film at our ‘Premiere’ on 28th September at Broomfield Hospital. It has been a fantastic experience working with such passionate and committed people. We urge all health and care professionals to watch it and learn from it and put into practice. Can you be that person to make a difference? 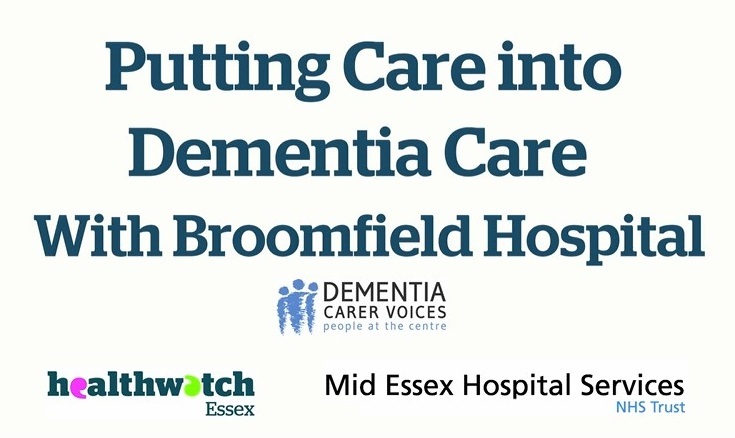 You Can View the Film Here ‘Putting care into dementia care’ training film is a collaboration between Healthwatch Essex, Broomfield Hospital and Tommy Whitelaw, from Dementia Carer Voices.